The joke spoke to a pervading anxiety that the financial rewards of white collar work may be meagre compensation for the costs it exacts. Now, along comes Matthew Crawford to rub salt in the wound with his thesis that the manual trades may also be more intrinsically rewarding. The Case for Working with Your Hands (published in the US as Shop Class as Soulcraft) owes more to Marx than I had appreciated from reading reviews of the book. Crawford provides a critique of the alienation of work in corporate capitalism. He extrapolates the trends that Marx identified in 19th Century manual labour to show how so-called ‘knowledge workers’ in contemporary capitalism are subject to the same phenomenon. The argument is not new. What differentiates this book is that, while Crawford writes from the perspective of an academic philosopher, he builds his argument from his own direct experience in the manual trades (electrician, motorcycle engineer) and desk work (a writer abstracts of academic papers, a research fellow for a Washington think tank). Crawford finds that his experience of manual work is more intellectually challenging and more intrinsically satisfying than his experience of knowledge work. As an electrician and running his own motorcycle repair shop, he finds engagement in problem solving, in creating something and working to demonstrable and tangible standards. There is holistic pleasure in working with both hands and brains, and daily experience of failure from which one learns, accumulates tacit knowledge and acquires mastery. He contrasts this with our normal experience of alienation from work both as workers and as consumers. At work, jobs have been overwhelmed by bureaucracy and the stripping away of much of their intellectual content as the focus of corporations becomes the creation of maximum value for shareholders rather than for end-users. As consumers, we have no interaction with the products that we purchase which are designed to ‘free’ us from the need to fix or maintain them ourselves. He cites a model of Mercedes car which does not include so much as a dipstick to check the oil. The car still needs its oil levels to be topped up regularly but the owner is expected to leave this to the service engineer. Crawford finds it perverse that Western democracies are alert to the dangers of a concentration of political power but not to the risks of concentrated corporate power. He advocates that, as consumers, we should show apply to our purchasing sensitivity to the impact of the production of goods and services on human dignity — in the same way that many routinely consider environmental issues. At work, he favours occupations which offer face-to-face interactions rather than control by remote forces, responsibility for one’s work, and solidarity between colleagues. Such solidarity, he argues, is derived from the respect for each other which comes from working to clear standards and seeing colleagues do the job well. Crawford offers nothing constructive for the masses of people who work in large organisations. The consolations of the trades cannot be readily established in the office. Crawford himself acknowledges that to address the problems he identifies would require a revolution in the regulation of large corporations. Rather than hope for this, he suggests, individuals would do better adopting a ‘Stoic’ attitude — seeking out “the cracks where individual agency and the love of knowledge can be realized today, in one’s own life.” For many people, those cracks are to be found mainly in their personal space away from work — which is a measure of the very alienation that Crawford seeks to highlight. 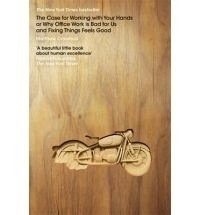 The Case for Working with Your Hands provides a thought-provoking critique of how we work. It offers a glimpse of a more sustaining alternative. But it strikes me as the beginning of a discussion rather than the last word. The Case for Working with Your Hands, by Matthew Crawford. Available from Amazon. Image courtesy Seattle Municipal Archive.